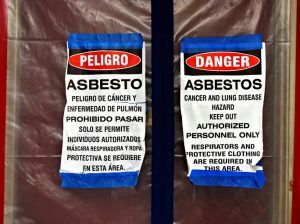 Why is it important to minimize your exposure to asbestos? Many of us know that asbestos is a dangerous substance that should be avoided. But plenty of people have no idea why asbestos is so harmful. Without knowing the real reasons why, it can be hard to stay motivated to proactively prevent exposure to asbestos. Asbestos is a naturally occurring mineral fiber that features ideal fire-retardant and insulating properties. Because of these properties, it was used in just about every commercial and residential building in the US and many other places worldwide until the 1970s, when it was discovered to be a carcinogen (a material that can cause cancer). To this day, many homes, businesses, schools, and other buildings built before the 1970s contain asbestos. Is asbestos a big deal? In a way, the presence of asbestos isn’t a huge deal. The problem is when the material containing asbestos is disturbed, releasing microscopic fibers into the air, which can then be inhaled by anyone standing nearby. So if there’s any chance that the asbestos fibers could be disturbed, either during a construction project, curious little hands, or any other cause, it’s essential that you have the asbestos properly removed from your property ASAP. If the asbestos fibers are disturbed and inhaled, people can develop serious health problems including asbestosis, mesothelioma, and lung cancer. How do I find out if my property contains asbestos? You may not be sure whether your property contains asbestos or not. Don’t stay in doubt – call H2 Environmental Consulting Services at (800) 524-3578 for all your asbestos detection and remediation needs. We’re Southern California’s asbestos specialists, and we have the manpower and technical expertise to handle any size project you have. We’ll be glad to schedule an appointment for a complete environmental evaluation of your property. With our specialized equipment, we’ll analyze every molecule of your property – including its water, soil, air, and physical structure – to check for common contaminants like asbestos as well as lead, mold, fungus, PCBs, and more. Then we’ll provide you with a complete report that specifically indicates where and what contaminants are present on your property. We’ll also propose a plan to completely eradicate these harmful materials from your property. Our remediation services strictly follow all federal and state regulations regarding safe removal and disposal of all contaminated materials. You’ll be able to breathe so much easier when H2 Environmental Consulting Services finally signs off on your property and guarantees that it’s 100% contaminant-free. Schedule your environmental evaluation today! Call H2 Environmental Consulting Services at (800) 524-3578, and we’ll be happy to assist you. We’ll answer any questions you may have, discuss your unique environmental management needs, and schedule your property’s environmental evaluation for your earliest convenience. Our mission is to make Southern California a safer, healthier place for all residents and visitors, one property at a time. Call us at (800) 524-3578 to get started today.